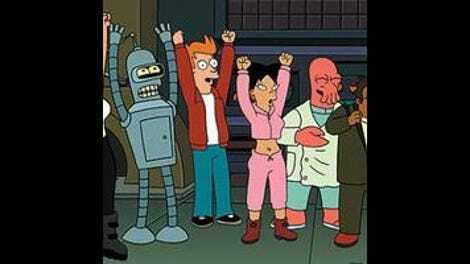 Fry and Leela’s romance gets more attention, but the friendship between Fry and Bender is just as important to Futurama. It tended to be more of a focus in the show’s first season, while Fry was still adjusting to the world of tomorrow; any self-respecting 20th century man who arrived in the year 3000 would have to become besties with a robot. More than that, it’s a combination that can generate a lot of great comic material. Fry’s guileless trust against Bender’s endless capacity for self-serving scams makes for a pairing that can be hilariously funny and deeply sincere, often at the same time, with both characters' less appealing aspects (Fry has what you could diplomatically call a creative approach to hygiene; Bender would harvest your organs if it occurred to him to do so) working to undercut anything approaching the overly sentimental. So far this season, the writers appear to have made a conscious effort to draw on the show’s deepest, and most affecting relationships. That means exploring (and getting some “awwwww” moments) out of Fry and Leela’s courtship, but it also means renewed attention to Fry and Bender. The last few episodes have all stressed the latter connection, even when it wasn’t directly related to the plot, and “The Inhuman Torch” makes great use of all that build up. It’s the best half-hour of the season this far. If Fry often acts like a good-hearted 12-year-old, Bender is the 12-year-old your parents don’t want you hanging out with—he drinks, he smokes, he sleeps around, and generally does everything that just isn’t done by nice people. But like Fry, Bender’s childishness is what keeps him from being a monster. One week, he can plot to destroy the world; the next, he can plan to sacrifice himself to save it. And both plans feel consistent to his character because they’re driven by big, over-sized ambition. “The Inhuman Torch” plays off that tension for a while by keeping his motives secret for the first half of the story. When a disaster on the sun brings the Planet Express crew to the rescue, Bender saves the day by failing to grasp the underpinnings of one of Newton’s most basic laws. He selfishly tries to get out of the action, ends up throwing himself back in, and then, because Morbo the newscaster (and everyone watching the news on Earth) believes him to be a hero, he goes back in to rescue everyone else. This decision sets the course of the rest of the story, as the Mayor, desperate to replace the team of firefighters he fired in order to afford Bender’s hero medal, hires the Planet Express crew to take up the slack. Fires keep popping up around the city, and Bender keeps getting all the acclaim (“Hero Robot Saves Cat, Two Others”; “Hero Robot Rescues Valuable Money”; “Hero Robot Thwarts Ironic Fire In Hell”). Which makes everybody suspicious, especially seeing as how Bender always seems to be at or near the locations where the fires spring up before they start. It’s a clever piece of misdirection that works off our own knowledge of the character to lead us off track; structurally speaking, the “We all assume this is true for the first 15 minutes of the story” red herring is almost always a red herring if there’s any ambiguity whatsoever, but given Bender’s basic misanthropy and selfishness, it seems all too plausible that he’d be lighting fires to make himself look good. Fry, the only person who will stand up for him, doesn’t really help his friend’s case when he points out all the motives why Bender would set fires, only to argue that he wouldn’t do it for his own ego. Because, well, wouldn’t he? Whether he would or not is moot, though, since he isn’t; turns out that the fires everyone’s been fighting have all been started by an evil blue flame Bender picked up back on the sun. It’s a very silly idea that works because it justifies Bender’s connection to all the fires in a way that doesn’t come across as a cheat. The third act has Bender trying to isolate the blue flame from anything flammable, and Fry first believing in his friend, then giving up on his friend, then believing in him again. The story is solid, and the emotions behind the story are solid too; it might be weird to see Bender in full on hero mode, but it works, and there’s something funny about seeing Fry fail to believe in him the one time he’s actually telling the truth. Even better, the conclusion of the episode puts Fry in a situation where he has to claim responsibility for the crime he was pinning on Bender earlier, giving both characters a chance to sacrifice a little dignity and share a crazy secret together. “The Inhuman Torch” had a sharp script, some great jokes, and a satisfying story that built off of a strong relationship. Felt a like old times. The direction of the opening shot—which started on Earth before zooming out into space and landing at the helium mine on the sun—was very nifty. Farnsworth’s “Good news!” jokes are as old as the show by now, but the timing of this one was really great, right down to the pained groans of the crew.